Just as Drew Farthering thinks his life has calmed down some, Fleur Landis, a former girlfriend, reappears, in dire need of his help. 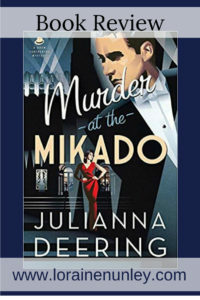 She’s married now, no longer an actress — but the lead actor in her former troupe’s production of The Mikado has been murdered, and Fleur is the police’s number one suspect. Drew would rather focus on his fiancée, Madeline Parker, and their upcoming wedding, but he can’t leave Fleur and her family in the lurch — even if she did break his heart once. As Drew, Nick, and Madeline begin investigating, they discover more going on behind the scenes of the theater troupe than could ever have been imagined. It seems nearly everyone had a motive, and alibis are few and far between. Both the murder case and the presence of the beautiful, exotic Fleur put a heavy strain on Drew and Madeline’s relationship. Will their still young romance survive the pressure? It seems almost morbid to so enjoy a mystery revolving around gruesome deaths, and yet I cannot escape the fact that I did enjoy it. Very much. So many suspects to consider. What fun it was to work with Drew once again to solve this mystery. Drew is making a name for himself as the go-to amateur sleuth. I love the way his analytical mind works. Even more enjoyable is the love that he shows to Madeline who makes him vulnerable and strong at the same time. This time the case lands in his lap but he is not eager to pursue it given that the number one suspect is a former girlfriend. Plus the history between them gives Madeline pause as to whether they should continue with the wedding plans. 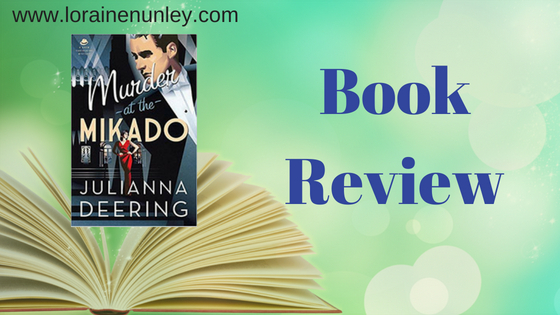 It made for some heart wrenching and edge of the seat, page turning moments. Will they get married? This story is more about Drew than Madeline, but the times that we are privy to her thoughts made me want to hug her and shake her at the same time. As an added bonus, some clues are given about a mystery even more personal to Drew. It whet my appetite to read further. I’m so glad I have the next book already in my library. Drew, as usual. There is something so appealing about his personality. I didn’t like Fleur but her treatment of Drew paved the way for God to put Madeline in his life so things worked out in the end. Would I recommend this book to others? Definitely. An interesting mystery with a good amount of suspects to puzzle about. Sprinkled into the mix is an inspirational thread and the growing pains of new love. And then there is Drew. The hero. Dare I say, one of my favorite heroes in historical fiction? This is the third book in the series. It can be read as a standalone story, but I dare you to stop at one book about Drew Farthering when there are others.